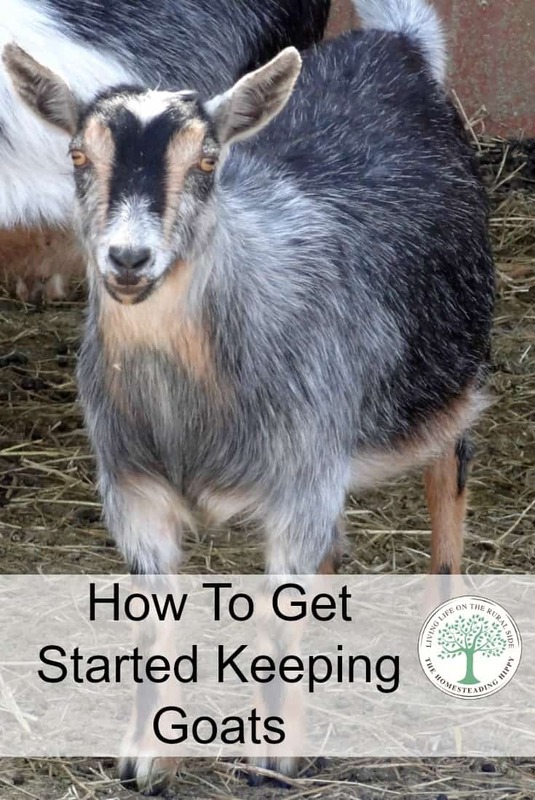 Are you wondering how to get started with goats on your homestead? Well, you’re not the only one – after chickens, goats are the fastest growing livestock animal in the US today. They’re becoming very popular on homesteads because they’re easy to care for and useful. They don’t require pastures, are easily handled and housed, and can provide meat, milk, fiber, fertilizer, and brush control. Goat milk and meat are actually preferred over cow milk or meat in most of the world; and homesteaders in the US are catching on. But, before you bring them home, here are some things to think about. Goats are divided into three types; meat, dairy, and fiber. Several of the main breeds that are available for each type in the US are shown below, along with typical weights and sizes. Any of the breeds can be used for both meat and milk; but they’re classified according to their main use. There’s also one breed within each type that’s considered miniature (the Pygmy, Pygora, and Nigerian Dwarf), and that can be kept in suburban settings (if local zoning allows it) because of their small size. (will it be primarily for milk, meat or fiber); what breeds are available in your area, the cost, and breed size. If you’re planning to drink the milk or eat the meat, then it’s important to taste that breed’s milk or meat (milk taste particularly can vary substantially from breed to breed). If fiber is the goal, then make sure the breed you’re interested in produces the right kind of fiber. You also need to decide whether you want purebred goats; it’s easier to sell their offspring, but if they’ll be used for meat anyway, it may not make sense to invest in purebreds. And finally, think about size. Standard size goats can be a lot for small women and children to handle whereas the miniature breeds are easily handled by almost anyone. Make sure everyone’s comfortable with the breed size that you’re choosing. Once you’ve picked a breed, it’s a good idea to visit some reputable breeders. You will want to look over their goats, ask questions, and make sure you’re happy with the support they’ll provide if you buy from them. It’s often hard to find experienced goat veterinarians, so having a “mentor” can be invaluable. There are also several serious goat diseases that you’ll want to avoid (CAE, CL, Johnes, Brucellosis, and TB); and reputable breeders will provide evidence that their herds are disease free. It’s better to avoid goats from auctions, as they can bring hidden problems or diseases with them. Goats are very social creatures, so a herd should start with at least two. But since goats multiply rapidly (they usually have at least 2 or 3 kids per year), a herd can grow quickly from just a few does (mature female goats). Male goats (bucks) are quite smelly during the mating season, and many choose not to keep bucks if there are other good bucks in the area that can be used for stud service. If a buck is kept, it’s often housed separately from the does, and also needs a companion (another buck or wether (castrated buck)). Bucks are housed separately so that the buck smell doesn’t affect the milk, and so that it’s known when the does have been bred. Goat housing ideally includes a barn with room for the goats and their kids, water, feed storage, lights, and an area to milk in (if you’re going to be milking). All that’s absolutely required; however, is a three-sided shelter to keep them dry and out of the wind. They do need protection from predators (coyotes, mountain lions, stray dog packs, etc. ), so housing them in a barn often makes sense. Milking, kidding assistance, feeding, and watering are also much more comfortable for us when they’re in a barn. Goats need a minimum of 10’ to 15’ square feet of indoor space if they also have access to outside space. When planning space, keep in mind that like chickens, goats multiply quickly and can be habit forming. Goats prefer wooded browse to manicured pastures because they like to reach up to eat rather than down like sheep or cattle. They also happily eat things we consider nuisances like poison ivy and brambles. In addition to browse; they need good hay, goat minerals, water, and grain (when pregnant or milking). If an area for browsing can’t be provided, goats will do fine on hay alone for roughage. They also generally need regular hoof trimming, a couple of semi-annual vaccinations, and worming to prevent internal parasites. Goat fencing is a very important, as goats are escape experts. There are many options available, but woven wire fencing that’s at least four feet tall is highly recommended, and welded wire fencing is not (goats break the welds by rubbing and standing on the fencing). Many owners combine woven wire fencing with electric strands at the top and bottom (on the outside). The electric at the top keeps the goats off the fence and the electric at the bottom helps keep predators out. Woven wire spacing of 2” x 4” rather than 4” x 6” is recommended if horned goats or miniature breeds are being fenced (so the horns don’t get caught as easily and the miniatures can’t slip through). If you’re interested in meat goats, many find that goat meat (chevon) is easier to digest than beef or pork, and it’s low in fat (see below), making it a great source for homestead meat. The markets for meat goats include those for goat meat, show goats (4-H or FFA), breeding stock, and pack goats. Today, the meat goat industry is the fastest growing livestock industry in the US, mostly because of the ethnic demand for goat meat. With dairy goats, it’s obviously the milk that’s of interest – and that can also be made into yogurt, cheese, and butter for use on the farm. Milk from breeds of goats with higher butterfat content is typically sweeter and creamier than those with lower butterfat content. Selling goat milk or milk products is often difficult, as many states prohibit the sale of raw milk, and it may be against the law to sell milk unless you’re a Grade “A” dairy. If you’re planning to market goat milk, it’s a good idea to check your state rules carefully and proceed cautiously. There are; however, ready markets for goat milk soap, breeding stock, and show animals. Homesteads with fiber goats can process the fiber into batts, roving, yarn, and knitted products for extra income. In addition, the market for fiber goats is growing so there’s also good demand for breeding stock and kids. Besides all the practical reasons for keeping goats; goats are loving creatures that are just plain fun to have around. They’re very social, and if handled regularly from birth, form strong bonds with humans. And there’s no place happier than the goat barn during kidding season – goat kids are irresistibly cute! What are some reasons you are thinking of adding goats? Be sure to pin this for later! This is a great post! I’ve been thinking about goats lately, just in case we end up somewhere that we could have them 🙂 I’ll be bookmarking this one! I want some Nigerian Dwarfs once we move onto a homestead. Great post! This is so interesting and full of information that I’m definitely pinning for later. Hubby and I would love to buy more acres and actually have goats for dairy – thank you! I didn’t realize that goat meat was so low in calories compared to others. I learned something new today! We are thinking of goats! I’ll be showing this to my husband and daughter 🙂 Thanks for posting! We have been going back and forth when deciding to get goats. We want them for the milk, but don’t know what to do with them when we go on vacation. Since hubby will be retiring soon and our hope is to travel 4 to 6 weeks out of the year (Yellowstone, here we come!) we don’t know who will take care of the goats when we are gone. That being said, we would sure love to have goat milk to make yogurt, icecream and cheese! Hmmm….. we will have to think a little harder on that one! Great information! Eventually I will have my retirement farm, and posts like this help me decide what stock I need. Thanks! wow i did not know nigerians had the highest milk fat content i thought nubians was thanks great site. To get around the restrictions on the sale of milk, you might be able to lease the goats so the customer would pay the lease and pick up the milk produced. David, you’re right, in some states it’s legal to sell “goat shares”, pay the farmer to milk and take care of the goat, and pick up your goat milk. We are so wanting to get 2 dwarf nigerian goats for milking. We have the areas marked out for housing / milking and a pen for play area. The info here was very helpful !! You are a very good source of information, I will be following your posts for our homestead… Good write up!